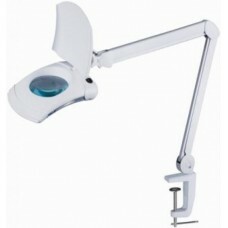 Magnifier lamp SIGMA 3D 80 (LED), buy at the price of 63 in Europe. Before performing any work is always carried out a preliminary examination and / or diagnosis. The more accurate the initial phase will be carried out, the less surprises during the procedure. At both stages the use lamp-Magnifier - a magnifying glass with an increase sufficient to quality diagnosis, and having powerful lighting with white light source. Lamp-magnifier Sigma 3D model 80 (LED) brings together an economical LED illuminator (consuming only 8W), giving even illumination and white magnifying glass with a diameter of 140 mm optical power 3 D (increase of 3 times). A distinctive feature of the model Sigma 3D 80 (LED) - rectangular, slightly curved plastic body size 26h19,5 cm and a thickness 4cm. 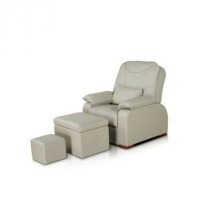 Due to the small curvature of the body, reduces the amount of light reaching past the working area. Another feature of this model - double row of LEDs in the illuminator. For the convenience of the master, the body has a curved handle for easy movement of the illuminator. Bottom LED illuminator covered with a transparent protective screen. On top of the loop is closed by a large dust and tight-fitting hinged protective shutter. The body lamp head is in the shape of a rectangle with rounded corners. Bracket lamp consists of two folding sections, each 45 cm long. This will move the lamp from the table level to a height of 0.9m. 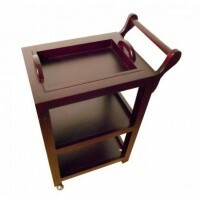 The lamp is equipped with a metal clamp for fastening to a table or carriage cosmetic, but can be mounted on a movable stand with wheels to facilitate movement.